Blue Hill Escape was the centre of the Fynbos Endemic Birds Survey, a postdoctoral research project initiated in 2012 through the Percy FitzPatrick Institute of African Ornithology (University of Cape Town) and the South African National Biodiversity Institute (SANBI). Fynbos is that habitat of the Cape Floristic Region that is dominated by Protea, Erica and Restio plant families. It has very high plant species richness, most of which are only found in the Fynbos. 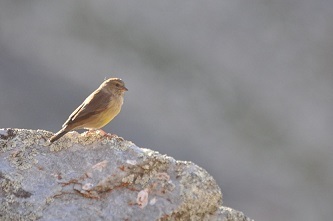 There are also eight species of bird found here and nowhere else in the world. The project aimed to determine the status of these endemic birds of the Fynbos in order to understand how populations will fare in a future warmer, drier climate that may also be prone to increasing frequencies of fire. At the moment, all these species have been the IUCN conservation status of 'Least Concern', as they are perceived to have large ranges, which are well protected, together with fairly large and stable populations. 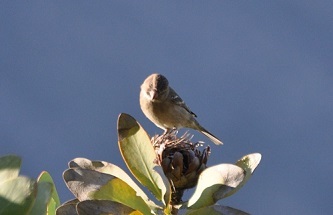 However, Protea Seedeater and Cape Rockjumper are predicted to loose large areas of their range due to climate change (see species accounts under Birdlife International). However, the basis for this judgement tends to be species accounts from field guides. During 2012 a major survey was conducted across the extent of the biome, from Baviaanskloof to the Cederberg, from sea level to the highest peaks of the Swartberg. To make it interesting, the survey was done by bicycle, part of a fund-raising exercise run in conjunction with Birdlife South Africa (South Africa's leading bird conservation organisation). 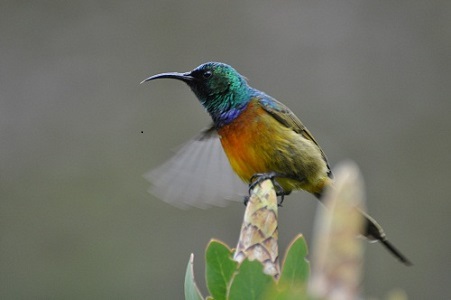 The survey found that Cape Sugarbirds, Orange-breasted Sunbirds and Victorin's Warbler are all vulnerable to the impacts that the future climate will have on vegetation structure. 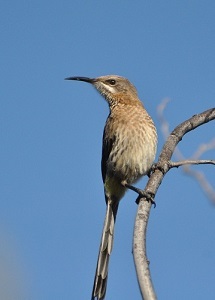 Cape Sugarbirds are especially vulnerable as the Protea plants on which they feed are likely to suffer with too frequent fires. 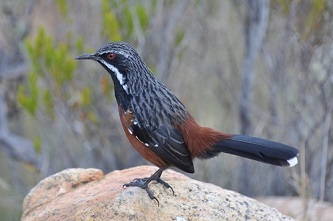 Furthermore, those two species predicted to lose their habitat in the future – Cape Rockjumper and Protea Seedeater - show a pattern that suggests they do not like very hot temperatures. Not good news at all. Since 2013, further surveys were conducted around Blue Hill Nature Reserve and the surrounding area, including the Kammanassie, Outeniqua and Kouga mountains. 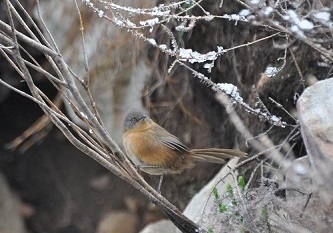 A major focus of the work involved trying to understand how mobile these birds are by catching them using mist-net and then giving the birds unique rings. Several students have used Blue Hill as a base to do their research or writing up: Krista Oswald (PhD), Campbell Fleming (MSc), Robyn Milne (MSc), Jerry Mokgatla (MSc), Daniel Cloete (PhD), Matt Macray (MSc). We have hosted Biosphere Expeditions volunteer groups for several years. 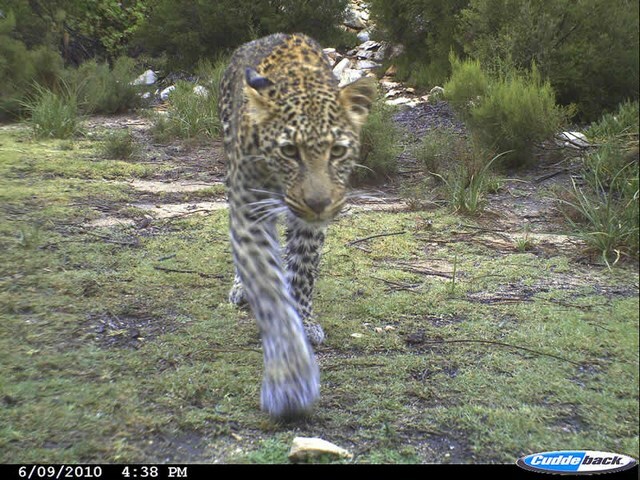 We also facilitate research into the Cape Mountain Leopard, conducted by several researchers.